How can I add footsteps to my character (There's no mesh). Ok so here's the screenshot of the graph! Also, I forgot to set the timer to loop & the time to something like 0.2. Thanks for the screenshot! But I have 1 problem, In 4.8 I can't find "Clear Timer by Handle" and "Set Timer by Event". I could only find "ClearTimer" , "ClearTImer_Delegate" , "Set Timer", "Set Timer_Delegate" any ideas what should I do? Hahaha I'll see what I can do. Anyways thanks for the help! I'm not so familiar with the answerhub, so how could I give you some karma? Done, Thanks again for the help! On tick, you check IsMoving and if is, check if velocity is over limit (so is actually moving). If both are true, do nothing. If IsMoving is false, check the velocity again and if is actually moving, set IsMoving to true and add a looping timer that plays sound. Also for some effect, on the timer, I recommend using flip flop and each other sound has just a bit difference in pitch multiplier. Thanks for the answer! but could you please post a screenshot of the blueprint? And yes there's no mesh at all. Well, instead of using tick, you could instead use an Anim Notify to play a sound at a specific point in the animation, the same techniques can be used for Particle Effects and custom events too. All you have to do is. Click on the animation you want to open up persona. Then just set the sound. Well, instead of using tick, couldn't you start the timer whenever the movement key is pressed? And the play sound event then checks to see if it can play a sound there, if it can, play the sound, else don't play sound. Because the major issue I see here is that what if you are moving but falling? Footsteps will be heard even though you are in mid air. You could be right. 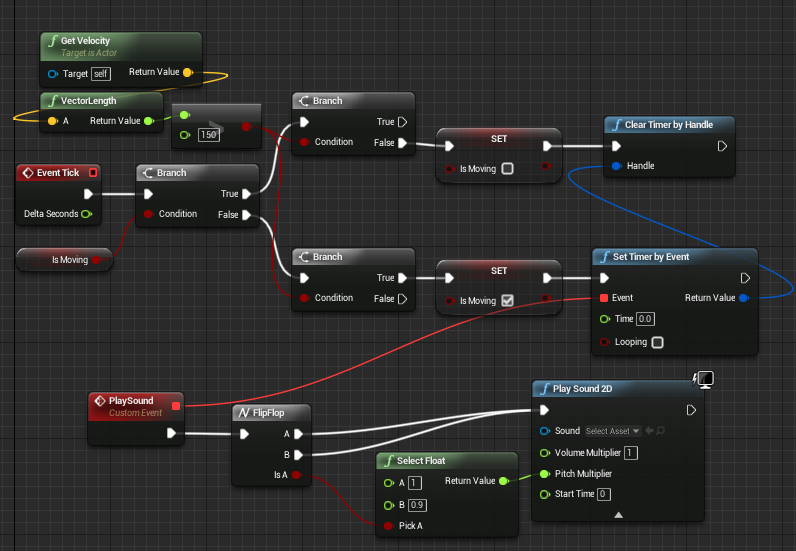 For the falling problem, when try to play the sound, add branch to check if IsFalling (Character Movement) is false. How to get UVs from a skeletalmesh?